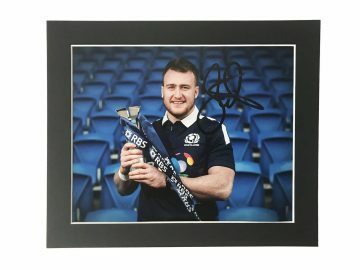 Shop our signed Scotland rugby memorabilia including signed Scotland rugby shirts, balls and photographs. Many with photo proof. All with a Certificate of Authenticity, fast worldwide shipping and free UK delivery! Rugby in Scotland dates back to the late 1800s, when they started their illustrious history in the game with a win against England. Since then they have continued to make their mark in world rugby and at home as part of the Six Nations. 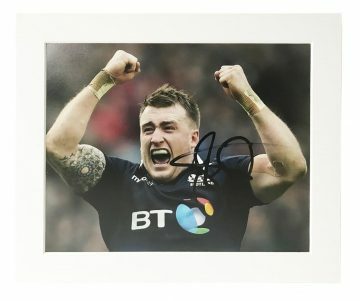 Browse our signed Scotland rugby memorabilia collection today to unearth exclusive items and fantastic finds spanning its 100 year history in the sport. Scotland competes annually in the Six Nations Championship alongside neighbours and rivals England, Ireland and Wales. They have won the title a respectable 15 times, sharing the process a total of 9 times. In the Rugby World Cup Scotland have never come away with a trophy, but the side has finished as runners-up on several occasions. They have competed since its inception in 1987. Add this to three Grand Slam wins and 7 Triple Crowns and it’s easy to see why they’re ranked sixth in the World Rugby Rankings. Scotland also participates in the World Rugby Sevens series each year – winning once to date at the London games in 2016. Scotland’s strong rivalry with England makes for thrilling viewing each time the two sides clash. Each year they compete for the Calcutta Cup, a fixture that is now a permanent part of the Six Nations championship. So far England is dominating the scoresheet– out of 136 matches England have won 75 times whilst Scotland have triumphed 43 times. 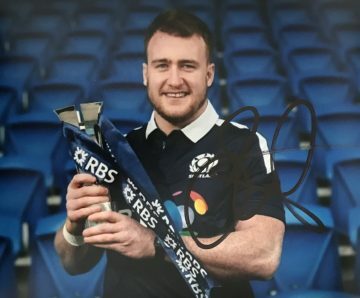 Here at Firma Stella we have a fantastic collection of signed Scottish rugby memorabilia for proud rugby fans and collectors to choose from. 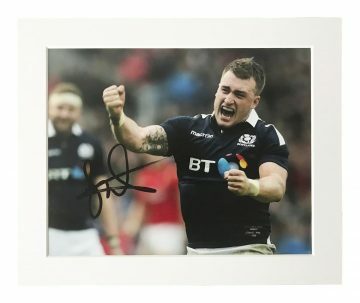 Browse our brilliant selection of signed Scotland rugby balls, mounted displays, shirts and photographs, autographed by some of Scotland’s most iconic and celebrated players. Each and every item is carefully selected from our dedicated sources, supplied with a certificate of authenticity for complete peace of mind.